I am back from OnStage and squeaking with delight. The new Annual Catalog is absolutely delightful. Sorry, I can’t show you the inside, but tomorrow I will show you some cards we make at the table. As the weeks go on I will be making some cards with the new stamp sets and new colors. This is one of the FREE Stamp Sets I received. Also, don’t forget the Big Shot and Trimmer are retiring. This includes all the accessories and blades. At some point, another version will be introduced and we don’t know when. You will want these for your paper crafting. There new dies in the 2019-2020 Annual Catalog and you will need a Big Shot. Happy Shopping!! However, I think whether are a Beginner or a Casual/Avid Stamper you will enjoy this card. I think at times we all need a quick simple card. This one will work as a note to someone, a Thank You, Get Well, or a Birthday. So enjoy This Little Piggy. 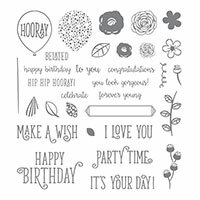 Check below for all the Stampin Pink Rose News. You don’t want to miss it. Color Challenge Due by Friday Noon CST to be posted on Saturday. Remember to use these colors. Then you will be entered in the April Drawing for a special product. Newsletter Tuesday Sign Up Today!